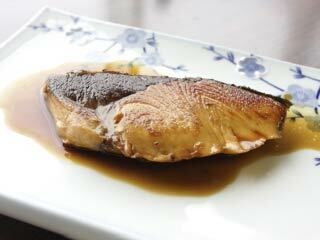 "Teriyaki Buri," Teriyaki Yellowtail is popular Teriyaki dishes in Japan. Teriyaki is the grilled food with Teriyaki sauce. Teriyaki literary means shiny grill because the sauce gives food a gloss. Add 3 large table spoons of Soy Sauce. Add 2 large table spoons of Minin. Add 1 large table spoons of Sake. Add 1/3 large table spoons of Suger. You can use this for Teriyaki Chikin. Check out the taste of the sauce and adjust it the way you like. Add little oil on a heated pan, and grill yellowtails. Cook the surface of both side, then add Teriyaki Sauce. Don't use the strong heat. Use the small fire, and keep flipping and brushing them. Once, the yellowtails are cooked well, then that's it. Put them on a dish and add more sauce.